Meat, I like stewing steak best but all sorts work. tins of chopped tomatoes, see above. Fry the meat, mushrooms and crushed garlic in the olive oil. When the meat is browned, add the onions and the chopped tomatoes. Grind pepper into the mix until you are tired. Simmer with occasional stirring until the sauce 'inverts'. The trick with this sauce is to have enough olive oil. After the mix has been cooking for a while, the oil and the sauce should start to part company and the tomatoes take on an oily texture. This is what I call the 'invert'. If instead of inverting, you see a sheen of oil droplets over the surface and the tomatoes are watery, you need to add more olive oil until it does invert. If you add too much oil, you can always skim it off before serving, if you don't use enough you have a weak, watery sauce. Serve with pasta cooked 'al dente' and sprinkle fresh basilica and/or parmesan cheese over. Cook the spaghetti al dente drain and return to the pan you cooked it in. Add the whipped eggs, bacon and yoghurt and stir until the eggs set but don't become dry. You can return to low heat if this seems to be taking a long time but be careful not to overcook. Strictly, fresh cream should be used instead of the yoghurt but this is not good for you and the yoghurt is a good low fat substitute. Follow the general directions for Spaghetti Sauce, replacing the meat with the meat balls. Mix the ingredients. Heat up some olive oil in a pan at least 2mm deep. Make meat balls out of the mixture and drop them one by one as you make them into the hot oil. Roll the pan around so that the balls are coated all over with the oil. don't stick to the pan and brown nicely all over. Remove the balls as they brown and add new ones to the pan until they are all done. Continue with the sauce as above but stir carefully so as not to break the meat balls. Now of course almost everything said above for a meat sauce is wrong for a vegetarian one. Vegetables don't need much cooking so waiting for the sauce to invert is far too long for them. Start by frying some mushrooms with crushed garlic. [Ok tw skip this bit] Add the vegetables and tomatoes, fresh or canned. Simmer until the vegedivs are al dente. I remember Donato's first exposure to a meatless spaghetti sauce. [We hadn't heard of vegetarian in those days except to describe a group of weirdoes]. We went round to a friend's house and they invited us to stay for a 'quick' meal. Now I have few language [or social] skills and this family was a bit of a challenge. Their name was Delveccio and Francesca was keen to be seen as still young. Unfortunately, I heard the name as Vecchio and used that. Trouble is Delvechio means 'of old' but vecchio means just plain 'old'. Anyway they cooked up a very good, and quick meal using just home preserved tomatoes and capers. Sweat the onions and garlic in the olive oil, add the capers and tomatoes, heat through and serve with freshly grated parmesan cheese. Use the same approach to make shell fish spaghetti, heating the sauce until they open their shells. You could add white wine or fresh cream [NOT both] if you want it a bit more special. I'm told that in Italy they never serve shellfish with parmesan, I think they are probably right. One summer, Ann and a friend decided to go hitch hiking across Europe and just before they left, I asked them if they would look out for a pasta machine for me when they got to Italy. Such things were unheard of then in rural Cheshire. Ann was shortly to find that they were unheard of in Italy as well, as everyone she asked said that they were old fashioned and why would anyone want such a thing? Eventually, she did find one and brought it back for me. It also seemed to come packaged with a couple of Lambretta riding Italians but that is another story. I've still got the pasta machine and I've had a lot of fun with it over the years. It may not seem like a fun activity for a party but making pasta certainly is, but you'll have to try it for yourself to find out why. The machine also makes brilliant filo pastry which I use for Baklava . Form the flour into a pile and make a well in the centre. Break the eggs into the well and mix like you are making cement. Add extra flour if the mix is too sticky to knead. Knead until the dough can be handled easily and allow it to rest for 30 minutes or so. Next use the pasta machine to finish off the kneading. Set the rollers the maximum distance apart and pass the dough through them several times, reducing the distance apart as the process continues. Continue passing the dough through the machine and reducing the distance until the dough rolls out evenly and is the desired thickness. If cutting into pasta the thickness should be the same as the width of the cutter. This would give a square section to the pasta when cut. Its elasticity soon converts it to round when it relaxes. You will definitely need some help with this process, especially if you are trying to make very long pasta. Once you have your pasta lengths, hang them from coat hangers or hooks, and festoon them around the place. On Cribbit this means the whole boat, on land they could be laid out on a div or a bed covered with a polythene sheet, though I doubt that this is as much fun. The whole process is much easier with helpers and a bottle or two of Chianti, the latter being especially helpful to fill the time when you are resting the dough, which should be done often. The pasta can be used once it is dry, it does not need a long cooking time so watch it carefully as it boils. It is especially nice with a sauce made with a Fresh tomato sauce but this is not obligatory. It also makes very good filo pastry leaves, just keep moving the rollers closer together until the dough survives the thinest setting. Use for Baklava. If using meat, brown this quickly in the olive oil and then add the garlic, onions and mushrooms. If using fish, add after the other ingredients are done. Add the chopped up fresh tomatoes, heat through until some break down but don't try to render down to a sauce. This should be quite oily. Serve over the pasta with fresh Basilica sprinkled over at the last minute. In our free time, we managed a trip to the local market where I bought myself a ravioli mold. Previously I had always made them by hand but this device is very quick and convenient. It also came with a neat little rolling pin which turned out to be excellent for rolling out the dough and gauging its size relative to the size of the mold. I have to say that as usual I didn't follow the directions exactly as I like as much filling as possible in my ravioli and these instructions encouraged one to be mean. As we had a good picking of spinach in the garden and some left over cream cheese, I decided on a spinach and cream cheese filling. I also had 3 eggs, so decided on a 3 egg pasta as well. This made one and a half fillings of the mold which leads me to suppose that a 2 egg pasta would give just one filling. Which is plenty for a meal for two. Gently fry the garlic in the olive oil and add the chopped spinach. Alternate stirring madly with leaving covered in the pan until the spinach is cooked. Mix the spinach with sufficient cream cheese to hold it all together and put to one side. 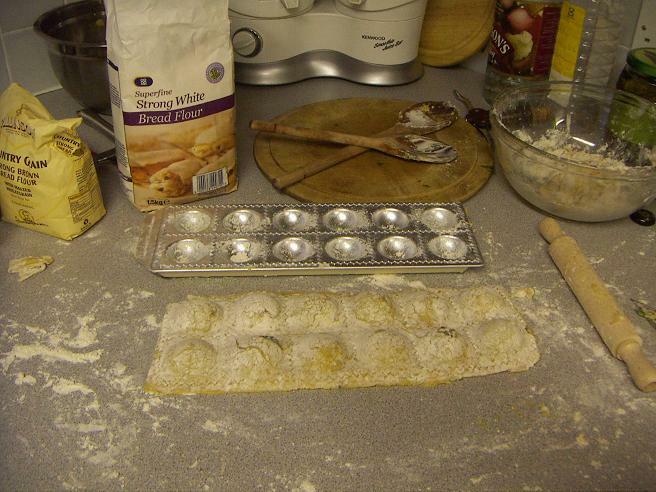 Roll out the pasta, dredge one side with flour and place floured side down in the mold. Put a teaspoon of the filling in each recess. Of course I used more than this so it was sticking up proud of the mould. Moisten one side of another sheet of pastry and place on top of the first one, damp side down.. If you've been mean with the filling, you just roll over the lot with the rolling pin. If not you must press down with your fingers to engage the serrated cutters on the surface of the mold. Then turn the mold over and out they drop. Gently boil them and serve with a sauce.